Ship’s Light has looked down Cross Street to Chatham Village Center for more than 180 years. Built and occupied by some of Chatham’s most eminent residents since 1825, it was converted to four housekeeping apartments for summer visitors circa 1945. Lovingly restored by long-time current owners, this gracious antique home offers modern comfort and convenience with the character and charm of a bygone era. Named for my grandmother, the “Lena Coleman” apartment is a three-room, one bedroom, newly-renovated gem. Airy and light, the eat-in kitchen boasts a bay window, with a round oak table and chairs and stained glass chandelier; the inviting living room has built in cabinets and a cozy window seat, two comfortable chairs and a flat screen TV. Wi-Fi is available throughout the house. Perfect for a couple, the bedroom has a comfortable queen bed and a natural bead-board ceiling with exposed beams. The bath is beautifully tiled with a marble sink and sky light. Enjoy your morning coffee on the private roof deck with your loved one or watch the sunset while sipping a glass of wine. The charm of the apartment is further enhanced by the warm glow of beautifully refinished, hand-laid, wide pine, antique floors. It's also very cozy in the off season as well, with wonderful radiant heat. 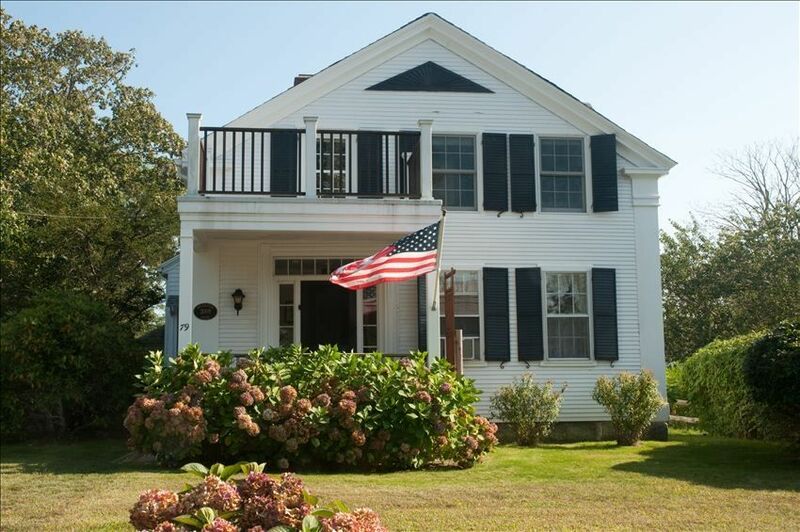 Centrally located within a short walking distance of excellent Chatham dining, shopping and band concerts, the house is three blocks from the town salt water beach on Oyster Pond, and one mile from Coast Guard Beach, a great stretch of Atlantic Ocean and dunes. Many individuals, couples and extended families consider Ship’s Light their vacation home. We invite you to join them in making your vacation something special. The Lena Coleman apartment at Ship’s Light is available for stays of 3+ nights during the summer and shoulder seasons and stays of 2+ nights during the off-season. Other units with unique features are also available and the whole house can be rented as a 5-to-6 bedroom home for family gatherings. My family has owned and loved Ship's Light since the mid-1970s. In the early 1990s, my partner and I renovated the Lena Coleman apartment and have spent many weeks and weekends fixing it up and finally after a few years, relaxing in it! It has been a labor of love to work on this lovely house over the decades and it evokes in me strong childhood memories of my grandmother. She looked forward to the summers when her long-time renters would return to visit, bringing with them stories of their winter months and great friendships built over many years. In 2010 we bought another house in Chatham and are busy fixing it up. Though we can hardly bear to rent out our beautiful apartment, we do take great pleasure in knowing that others will get to build their memories in our dear Ship's Light. Located on a quiet street just off Main Street, Ship's Light is perfectly located and convenient to everything. You can walk downtown to shop in Chatham's great stores, enjoy a meal at a great restaurant, get ice cream and attend Friday night Band Concerts; it’s a short walk to the public library and Methodist, Episcopal and Congregational churches; other churches are also nearby. Chase Park and the grist mill are right around the corner; Oyster Pond (a nice swimming beach) is a short 1/4 mile stroll; the Atlantic Ocean is about 1 mile away. Visitors love to sit and read on the porches and decks overlooking Cross Street and Shattuck Place; from these private perches you can put your feet up and watch the world go by. We thoroughly enjoyed our stay in the Lena Coleman apt. Everything was neat and clean and the place was bright and welcoming. Had all the amenities needed for a relaxing vacation. A Relaxing Balcony, overlooking a quiet street. A very functional kitchen, comfy living room and a bedroom that promotes restful sleep. One improvement that can be made is a bifold door to the bathroom to replace the curtain that is currently in place to give more privacy. Loved the proximity to town and it was a clean, charming vintage apartment. Just the right size for my husband and I for 4 days. The apartment was roomy and homey. Everything in Chatham is walkable, downtown just around the corner. Great spot! This little apartment has all the makings for a perfect single or couples getaway! From the retro kitchen sink to the 5’ tall refrigerator, this kitchen was well equipped with anything needed for whipping up a small dinner. The living area was small but cozy as was the bedroom. Everything was well appointed. The bathroom looks to be newly remodeled with adorable seashell tiles in the shower. There is one window air conditioning unit in the bedroom, though, could have used an additional one in the living or kitchen area as it was a very warm week in Chatham. The apartment is so conveniently located to Main St and within walking distance to Oyster Pond. The Colemans are lovely people and make themselves available to help their guests. As usual we had a wonderful time! Clean, charming, close to everything. Highly recommended!!! Loved our stay. This was our third year and we adored it every bit as much this year as the first. Sad to leave!!!! Highly recommended. 1/4 mile walk to Oyster Pond; other beaches available close by on ocean, bay and Nantucket Sound. Excellent birding at Monomoy wildlife sanctuary.